CAPE CANAVERAL, Fla. — The private rocket company SpaceX will have to wait at least three more days to send its Dragon space capsule on a debut flight to the International Space Station after unexpected engine pressure readings forced a last-second abort of today's (May 19) launch attempt. The launch countdown reached zero and the engines of the Falcon 9 rocket carrying Dragon ignited, only to be cut off seconds later because of an excessive pressure reading in one of the engines. "3, 2, 1, 0, and liftoff … we've had a cutoff," NASA launch commentator George Diller announced. "Liftoff did not occur. We have a launch abort." 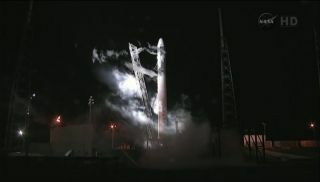 The unmanned Dragon capsule was due to lift off from the Cape Canaveral Air Force Station here at 4:55 a.m. EDT (0855 GMT), but the engine sensor reading forced the vehicle's computer to perform an automatic abort, NASA officials said. The rocket was already fueled for launch at the time. "Launch aborted: slightly high combustion chamber pressure on engine 5. Will adjust limits for countdown in a few days," SpaceX founder and chief designer Elon Musk wrote on Twitter just after the abort. This SpaceX mission is flying under the auspices of NASA's COTS program, which stands for Commercial Orbital Transportation Services. The Hawthorne, Calif.-based SpaceX (Space Exploration Technologies Corp.) has received $1.6 billion from the initiative to develop Dragon and to eventually fly 12 cargo delivery runs to the space station. If the upcoming final test flight goes well, the first of those delivery flights could launch in early fall, with two more to fly next year. SpaceX is one of two companies NASA has funded to develop robotic spacecraft capable of delivering supplies to low-Earth orbit in the wake of the space shuttle retirement (the other is Orbital Sciences Corp. of Dulles, Va.). The deals are part of the space agency's scheme to outsource space station transportation to the private space sector, allowing NASA to work on a new spacecraft and heavy-lift rocket for deep space. Ultimately, SpaceX plans to outfit Dragon to carry crew as well as cargo. NASA and SpaceX will hold a press conference on the status of the Dragon flight to the space station today at 6:30 a.m. EDT (1030 GMT).